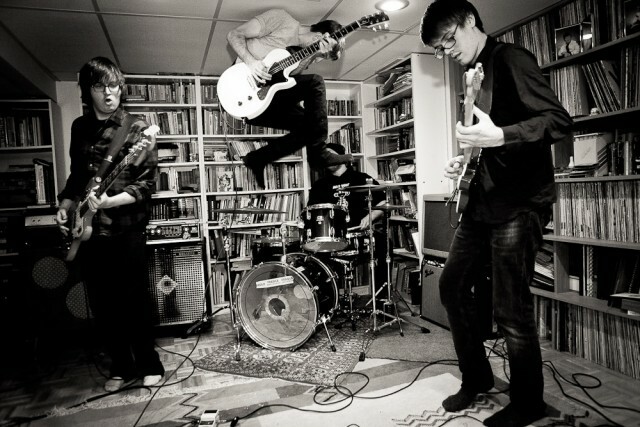 PUP is a young, hard rock band based in Toronto, Ontario. Known for touring hard and putting on riotous shows, PUP recently released their second album, The Dream is Over, via Side One Dummy and Royal Mountain Records and they will soon be touring the entire planet for months and months. Ahead of their return to Guelph’s Hillside Festival, I met with singer/guitarist Stefan Babcock and guitarist Steve Sladkowski on Steve’s porch in Toronto, mere hours after he and his girlfriend found out they were being evicted. A dog named Jane sat with Stefan, Steve, and I as we discussed the short but already tumultuous history of PUP, which science believes shouldn’t even be a band anymore, plus Roncesvalles Avenue, as a hood, Polish yelling, gentrification, High Park and poison cities, getting out of Dodge, a sudden eviction, when Steve lived in Guelph and first met Stefan at the Hillside Festival in Guelph, tour managing Zeus, hash brownies at Hillside, Zack the drummer, time passes slowly or quickly, pacing your not-as-young-as-it-was body, a Toronto heat wave, not curbing your enthusiasm, sustainable touring, van snacks, coffee and water and beer, tiny bladders and a presumably meddling landlord, bananas and spicy nuts, unsweetened iced tea, shotgunning McDoubles, ice cream, Waffle House, green juice, stocktaking and maturity and pacing a tour, Stefan getting told “The dream is over” by a medical specialist after experiencing discomfort from a cyst on his vocal cords, the visceral response to this issue, too many shows, vocal coaches and speech pathologists, the book Bad Singer and amusia, musical training, a rock band, the description of punk to come, the mythology surrounding punk and proficiency, resisting the terms of a medical diagnosis, the rarity of success in music making and creation, artistic freedom, playing the night of the diagnosis on the first day of a seven week tour, Stefan gets help from PUP patrol, the stress of bodily harm or alteration, the song “DVP” and the gestation of The Dream is Over, jokes and rage, Canadian enunciation and producer Dave Schiffman, The Bronx album III, Americans and “about,” pointed humour, imaginary and blunt arguments, apolitical lyrics and inclusive spaces, avoiding white mansplaining, the Hillside Festival, a long tour without writing new stuff, a conceptual proposal, the song “Familiar Patterns,” and then the dream was over.